Why would The Blackstone Group (BX) enter the manufactured home industry quietly, instead of with fanfare? Let that question percolate in your mind for a bit, because if a large operation like Bloomberg can’t pry an official statement out of Blackstone, then surely they must think they have a good reason? Keep in mind other in media are trying to get details from Blackstone or Tricon too. So once more for effect. Why would The Blackstone Group (BX) enter the manufactured home industry quietly, instead of with fanfare? ICYMI, read that report later, at the link, below. Logo provided under fair use guidelines. Tens of millions tune out politics (sad, allowing others decide your fate with no effort), so millions don’t know that Mitt Romney, the 2012 GOP candidate for president had long ties to Bain Capital. Mitt Romney’s father – George Romney – was at HUD from 1969 to 1973. That would have been during the era in the run up to the mobile home industry’s push in Congress for the passage of the National Manufactured Housing Construction and Safety Standards Act in 1974. Do you think mobile homes were ever discussed? Before you jump to the wrong conclusion, keep in mind that President Gerald Ford addressed the then mobile home industry’s convention in 1973. Again, ICYMI or this is your first visit, check out that report later, once you’ve carefully combed and absorbed this one. So would it be a surprise to learn that Bain Capital reportedly had (has?) interests in manufactured home communities, and thus in the manufactured housing industry? But guess what? Today’s Bain Capital won’t confirm or deny that point. That’s the Trump family with Robbie Antonio of Revolution Precrafted Properties. 5 years, when an official at the Trump organization then denied to MHProNews any ties to factory-built housing. 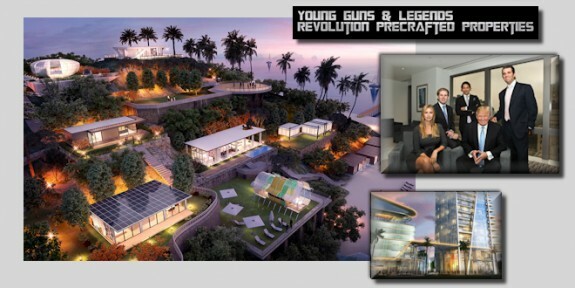 Now we know that there is some connection between the Trump family business, and rising unicorn star Revolution Precrafted Properties. What Does It Mean When Big Name Operations Won’t Mention Manufactured or Modular Home Connections? Stop and ask yourself this. Why has Manufactured Homes been the “Best Kept Secret” for so long? Why would Blackstone or Bain not celebrate their efforts to promote affordable quality living in America? Why did Donald Trump’s family, before he became the President of the United States (POTUS), go with supporting an international operation that does high end PreFab? Aficionados, professionals, and enthusiasts that read here run the size of operation, net worth, political and other gamuts. Why? After years of MHI ‘allegedly’ trying to undermine, sideline, malign or destroy MHProNews and MHLivingNews, we’re still number one by a country mile; why? Don’t forget these queries – because they are important for you and all pondering affordable housing. For now, set those questions aside for another time. Regular readers know we’re strong believers in using the correct industry terminology. Now set that important point aside too, and let’s look at some mainstream media reality checks. The nomenclature and some details aside – as important as those are – consider the case made for manufactured housing by CityLab in the article below. Note that CityLab sprung from the Atlantic, which previously reported on manufactured homes. Next, ask yourself why the case made by Warren Buffett’s own newspaper is weaker than the one linked above? 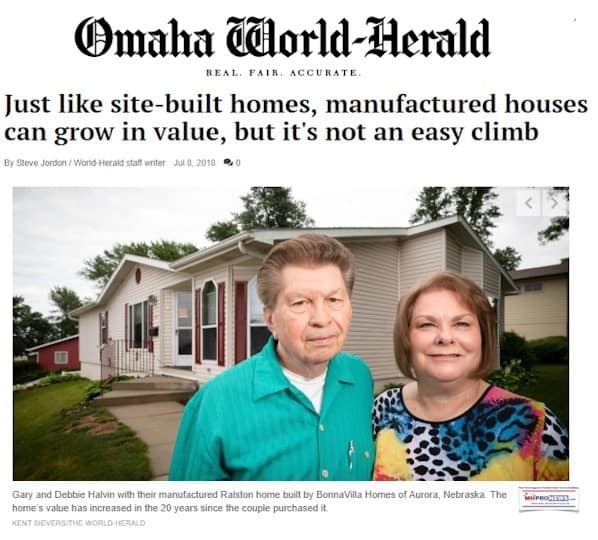 A close fisking of this article by Berkshire owned Omaha World Herald could reveal the need for a new mantra in MHVille, beware of Buffett owned media bearing ‘gifts’ for manufactured housing. https://www.omaha.com/money/just-like-site-built-homes-manufactured-houses-can-grow-in/article_f6390f94-59ab-5692-9cc5-3b24e8759533.html Note that this came not long after a Daily Business News article that questioned why Buffett had failed for years to use his media to promote a better understanding of modern manufactured homes. Coincidence? Let’s rephrase. 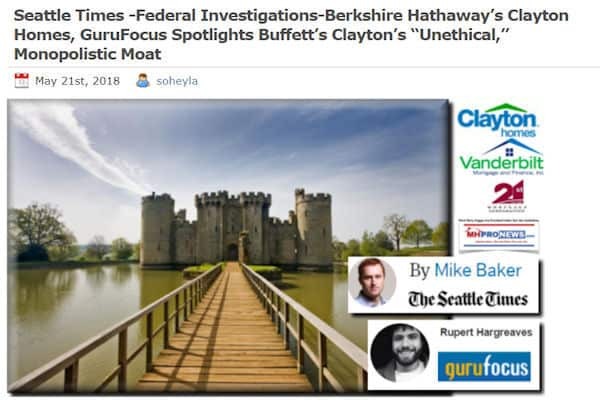 Warren Buffett’s Berkshire Hathaway owns Clayton Homes, 21st Mortgage, Vanderbilt Mortgage and Finance (VMF), plus a slew of other manufactured home industry connected companies. They’re cozy with “Frank and Dave’s” growing communities operation. So why aren’t Berkshire’s considerable media assets used to do an ongoing series on how manufactured housing is the solution to the affordable housing crisis that’s hiding in plain sight? Why would they come up with an interesting, but less than stellar piece like the one linked above? Warren Buffet understands synergy, because he’s mentioned it in his annual letter to shareholders. Stop, hold that thought, because we’re moving onto another. Investors Business Daily says that repatriation of cash into the U.S. is going at an annual clip of $1.2 trillion dollars, “…far more than the $35 billion one year before,” they said. That’s $100 billion dollars a month in capital coming in, looking for places to invest and grow. Housing is already a trillion dollar annual industry, and U.S. housing is worth trillions collectively. There’s reasons why Berkshire is buying market share in real estate brokerage. There are reasons why Buffett’s Clayton are buying stick builders. But manufactured housing is the potential home run business opportunity play. So why has Buffett kept the profile of manufactured homes so relatively low in his own Berkshire owned media outlets? Why did the Urban Institute – in their report on manufactured homes – fail to mention their ties to Buffett, or the “anonymous” input from MHI? Don’t forget but set those inquiries aside for now. 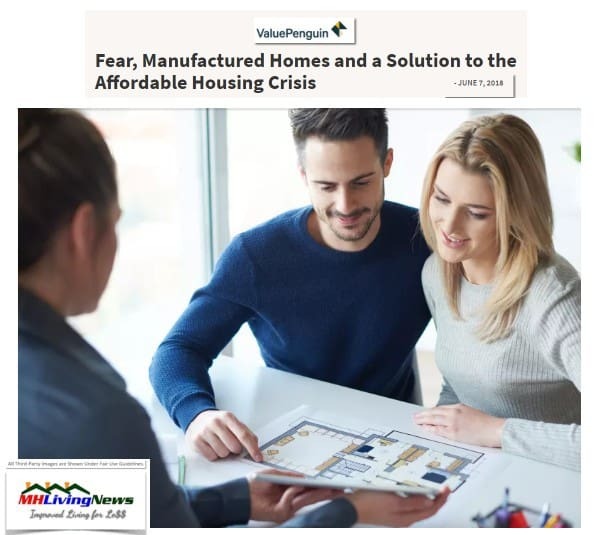 To oversimplify, there are broadly speaking, two currents in reporting by the mainstream media currently underway regarding manufactured housing. • tornadoes, windstorms, hurricanes – and these are of the “if it bleeds, it leads” media model. The odds were 1 million to 1 last year in favor of mobile or manufactured home residents not being killed by a tornado. Would you know that from any media sources but this one? • crime, community closures, and others black-eye stories. Let’s mention two other factoids for now. A) There are more HUD Code plants opening since 2016 than in many prior years. We’ve not reported all those new producers by name yet, but we plan to in an upcoming report. Nor have we at MHProNews mentioned each new expansion for an existing HUD Code builder, but may in time, as it too is an ongoing trend. The point is, new production is coming on line. One new producer that just opened tells me they’ll be at 3 homes per day by the end of this week. Brand new manufactured home builder, but those partners in the project understand the HUD Code manufactured home business. B) There are also new and expanding lending sources coming online in MHVille. I’m not talking about the GSEs. The point? The Capital is arguably available to break the iron grip of Buffett’s Moat. If you’re a first time reader – or someone who has only skimmed until now – read those related reports linked herein and below. What’s Still Missing for MH to Breakthrough? In my productive conversation with NAR’s Scholastica ‘Gay’ Cororaton, we discussed the “Tony Take” on “appreciation and depreciation.” Gay May get a call or two after this, but hopefully not. But suffice it to say for now, IMHO, we found broad agreement on the why’s and the what’s of what causes rises and falls in all housing prices, including manufactured homes. Rephrased, when deprecation occurs instead of appreciation, there are reasons that happens. They can be successfully addressed. CityLab did a better than average job, and deserve some kudos (terminology, etc. aside). But they and most in the mainstream still don’t grasp the full reality of manufactured homes. In fairness, how could they without more time and research? Again, CityLab deserves more praise than critique. The secret sauce to growth is a mix of logic, using deductive reasoning from known facts, some chutzpah, and the truth well told. There’s been an “info war” over manufactured housing for decades. Ignorance and prejudice are the enemy. There are two fronts to this info war. The internal battle, within MHVille, plus the external battle with the newsmakers and public at large. There are too many in our industry who skim. They do so because they think they know what someone is trying to say. Longtime industry success story and observer Marty Lavin, JD, told MHProNews recently, “So the association [MHI] is not there for the “industry,” unless the interests of the Big Boys join the industry’s.” The exit of several from MHI – and the birth of a rival – reveals that there are votes of no confidence taking place. The oversimplified truth about our industry is that we are the solution to the affordable housing crisis that’s been hiding in plain sight. How did that long-kept secret happen? The oversimplified answer is that forces within MHVille have limited or allowed limits on the industry in various ways, arguably through stupid greed, vs prudent and principled actions. I say stupid greed, because as believers in free enterprise and business success, we don’t think monopolistic strategic moats are how that’s best accomplished. There’s been artificial brakes applied to manufactured housing. Monopolistic practices, plus poor media engagement, are arguably among them. The fact that the big boys decline to comment on such matters, and decline debate too, says much. The world does not owe the manufactured housing industry much beyond an invitation to engage. It’s the job of every manufactured home industry pro, business, and association worth their salt to engage and make the case that addresses the unanswered questions tens of millions of Americans have. The fact is, most think they know, but what they know is often 42 plus years outdated info. Correcting misinformation and prejudice is profitable, and can be done at the local market level. We’ve been on a mission for approaching a decade. But the truth is, the mission began years before. This writer learned the hard way that an article every few months out of the year for a limited distribution industry publisher was not enough. By L. A. “Tony” Kovach, publisher, consultant, history buff, and manufactured housing industry expert. Connect on LinkedIn. For 2x weekly emailed headline news, click here.